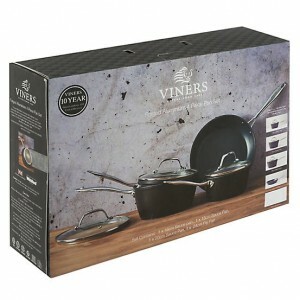 Viners has introduced a wonderful new collection of pans that will suit a wide range of needs and lifestyles. 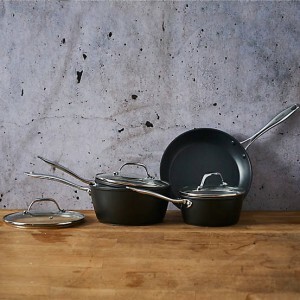 Viners pans are designed in the UK and the new collection offers two distinct ranges; Forged Aluminium and Copper Base. Each style features ergonomically designed, riveted handles for superior strength and maximum comfort. Another fabulous pan set from Viners is the Copper Base Pan Set. This collection features a striking contrasting design with a stunning copper-plated base teamed with a high shine mirror finish. These Copper Base Pans are incredibly practical in the kitchen and the bonded copper base distributes heat quickly and evenly. These pans have riveted handles for strength and durability and each pan features internal measurement markings as a guide when adding liquids. Unlike the Forged Aluminium Pans, the Copper Base pans are not suitable for induction hobs but can be used on any other hob. The fry pan in this set features a non-stick, double layer Whitford coating which is great for easy cleaning. This range also comes with a 10 year guarantee and 5 year guarantee on the fry pan. Both the Forged Aluminium and Copper Base Pans are perfect additions to your kitchen. These pans are durable and stylish and will help you cook food beautifully. Anyone who enjoys cooking at home will love these pans.